Basically a 3D image is added in real-time to a video. 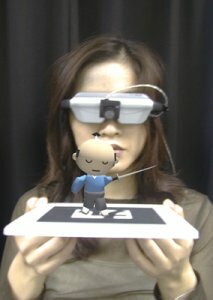 It does simple computer vision to find that black square platform, then overlays the image with a neat 3D character. I can think of hundreds of applications for this! Almost like a hologram, except you have to wear funny glasses. Very very very nice !! The funny glasses are just a video screen , right? Nice, i can think of many ways this technology could be used in presentations and virtual manufacturing. Is there any more videos on this? That is some pretty shiny tech. I sent the link to my brother (who is into 3d graphic design) and he plans to play around with it during spring break. That is sooooo cool, you can use it to watch tv on a virtual screen, lol. I would try to configure it to make it look like I am holding fireballs. Mother of Science! What will they think of next! You could bring so many things to life with that equipment! I've seen someting like this before a few years ago at an expo. But it was a bit different; they didn't use a marker (the one with black n white squares / marks). Instead, they can somehow anchor the virtual object to actual surrounding objects. So you can place anything anywhere without any special markers. And to achieve that, the user must also be wearing a gps and some sort of accelerometer to track its head and body position. They call it ARQuake; Augmented Reality Quake (yes, the game). Ooppss sorry my bad... they do use a marker, but only to track the user's thumb. Ok this could make my dreams of a cad program like the one in Ironman a reality!!!!! That's exactly what I thought of when I first saw this!